1970 - 1971 Dodge: Challenger models. Dodge: Challenger. O.E. 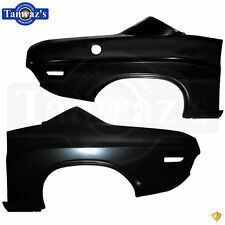 Full Style Rear Quarter Panels - Pair. LH - Driver's Side & RH - Passenger Side. 1972 - 1974 Dodge Challenger models. Front Fender - LH. 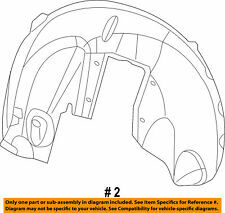 N ew ReproductionFront Fender. LH - Driver's Side. Used For 1970 ~ 1971 Dodge Challenger. 1970 1971 Challenger. Front Fender - Right. Right Side (Passenger Side). We will do our best to fix any issues if needed. Application: Universal Fitment (Please make sure to measure vehicle's fenders before purchasing) Product Description 100% Brand new Material: Polyurethane (PU) Color: Black Front: approx.2 Pcs : 790mm x 320mm x 50mm Rear: approx. 2 Pcs : 840mm x 360mm x 75mm Installation instruction is not included Professional installation is highly recommended Package includes 4pcs/set Fender Flares As Shown in the Picture above Installation Universal fender flares installation is normally done in 3 ways: riveted / bolted / sealant silicone.. Dodge Challenger. AMD Tooling. To Clarify, AMD has their own tooling and this is unique to them ONLY. 1972 - 1974 Dodge: Challenger models. AMD 700-2572-L. O.E. Full Style Rear Quarter Panel - LH. This is the wheelhouse next to the trunk floor which gets welded to the outer wheelhouse. Rear Inner Wheelhouse - Pair. LH - Driver's Side & RH - Passenger side. 1970 - 1974 Dodge Challenger models. Universal fit on SUV, Truck, Car Arch Wheel Fender Extension. 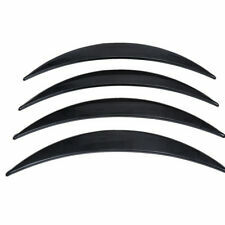 1 Pair of Tape on Fender Flare/Wheel Well lip- double Side Tape and adhesive promoter included. A necessity in many states where wide tires must be covered by a fender. Looking to add some style to your stock wheel wells? This set of Polished Stainless Steel Fender Trim is precision engineered to fit your 2009-2014 Dodge Challenger, constructed from High-Quality, Durable Stainless Steel and polished to a beautiful mirror shine!. Part Number: 12940. Xenon is proud to announce our New Scoop Line. Our design team has developed a Great Looking Quarter Window Scoop, C-Scoop, and Hood Scoop. We also inventory over 500 individual molds. 2 Pairs of Tape on Fender Flare/Wheel Wall lip. Flexible ( Flexible enough to contour to wheel wells perfectly) Plastic w/ Carbon Texture. Color: Carbon Fiber Texture. 13" Length x 1" Width x 0.55" Depth. 1972 - 1974 Dodge Challenger models. Quarter Panel Skin - LH. New Reproduction Quarter Panel Skin. LH - Driver's Side.